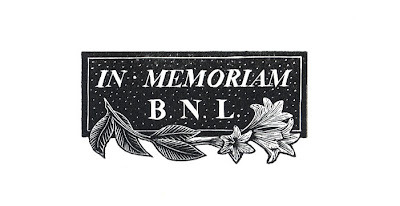 My book is dedicated to Brian North Lee (1936-2007). Many readers will be familiar with his books; others can find out about this remarkable man from an obituary. Brian was the first person to write seriously about my bookplates in "Contemporary International Ex-Libris Artists Volume 3", Portugal 2004. He encouraged me to work to improve my lettering which is still the subject of much of my effort. I was gathering together a group of recent work to send to him when I heard about his death. I regret not being able to show him the fruits of my labours. I had already engraved the lettering on the block but was not sure how to finish the image so I let the block sit on the shelf above my computer for a couple of weeks. In the end, I decided to engrave a single lily, sweeping round under the lettering and emerging from the frame. Clearing away the wood is a very time-consuming affair. There is no satisfactory way to speed this up, in my opinion, but there is good practice: use a round ended scorper, keep it very sharp indeed and only clear for a few minutes at a time. Even with boxwood, a sharp tool will cut through with little effort, especially if one makes small cuts, rather than trying to plough a furrow across a large area of the block. Again, I decided to have part of the decoration breaking out from the "frame" of the block; this called for more careful clearing. Gradually, I cleared around the text. I spent two full days on this block. I used my normal arrangement of a clear plastic file fixed to the tympan on top of the make-ready. This holds the paper. You can see the windows cut into the file - the blocks print through these, keeping the surface of the sheet clean. All of the printing is now done. Yesterday, I worked the handpress from before 8am until after 6pm and then engraved through the evening until just before midnight. Today, I trimmed paper and then printed from 9am until 5pm. This evening, I checked and folded yesterdays sheets. I am now going to mark the folded sheets ready to make the sewing holes. I plan to stop at midnight so that I can make an early start tomorrow - sewing day! The colophon says something about the production and limitation of the book. 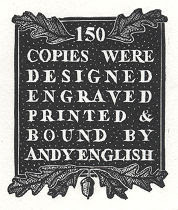 Although I have many cases of type, I have decided that the text of books made by Oak Apple Press should be engraved on wood. This is a lengthy process, but it is satisfying when it has been completed. At this point I check the text in a mirror - fingers crossed! Again, I cut the wood around the design to a lower level. Finally, I engraved small dots in a regular pattern around the letters. It was time to proof the block which would show any small adjustments that I need to make. I made a series of small extra cuts, taking the block through four states until I was happy. In the book, this will be printed on the final page, above the press device already described below. Time is really pressing on my book project. I am still engraving various blocks that I need to finish before I can print and bind it. I started with the press device which will be printed on the last page. My press is called Oak Apple Press after oak apples - not a fruit but the result of a gall wasp laying eggs in an oak tree. I engraved around the main shapes and then cut some detail into the different elements of the design. The tool shown is a round scorper; round ended tools are so much better for clearing away areas of wood. The next photograph shows the cuts made by the scorper. Every cut could potentially ruin the block so time and great care are taken. And here is the final result - a press device for the first book from Oak Apple Press! The etching is presented resting one a small sheet of museum quality conservation paper. Turning the sheet over reveals how it is fixed. Small pieces of conservation paper were pasted to the edge of the etching. These have been threaded through slits made in the new backing paper. All of this work is easily reversible.